Some chefs have reputations they don’t deserve; others definitely so, and when word got around that Jian Carlo – initially the pizza maker at County Louth, Drogheda’s La Pizzeria, when it opened about 25 years ago, and subsequently the owner/chef – was quite likely the grumpiest person ever to stand behind a food counter it fast became something of a running joke to see just how grumpy he could be. For a lot of people – with some justification – levels of blatant mild irritation from a front-of-house chef can be offputting, but as weeks, months and years passed, it became obvious that Jian Carlo’s bark was much worse than his bite. And besides - what brought people back to his wonderfully authentic restaurant, which resided on Drogheda’s Peter Street for over 20 years, was not his reputation for grouchiness but his skills as a chef. And so for over two decades, La Pizzeria became something more than just a great Italian eatery in a provincial Irish town; unwittingly, it turned into a signpost for the making of memories. For instance, as newly weds, myself and my wife regularly went there; we went there to celebrate the birth of our first child, and then our second, and subsequently brought them there with us from when they were toddlers to teenagers to adults. Throughout such a period of time, Jian Carlo’s steely resolve occasionally melted, and I swear to God I saw him smile and laugh sometimes. About four years ago, however, La Pizzeria closed its doors – right in the middle of the recession, the property’s landlord had raised the rent, and so Jian Carlo hightailed it outta town and set up new premises eight miles up the coast, in the village of Clogherhead. La Pizzeria leaving Drogheda was a body blow – not only to the regulars, but also because it remained easily the best and most reasonablly priced place to eat quality food. It has been some time since we last tasted pasta and pizza cooked by Jian Carlo, but a family reunion of sorts took place a few weeks ago, and if there was one place we wanted to go to it was La Pizzeria, out of town or not. The new premises isn’t that new anymore – almost four years have passed, but you’ll be glad to hear that the chef’s demeanor hasn’t really changed. A curt nod is all you’ll get, and then you’re walked to your table. One of the bug bears of newbies to La Pizzeria’s serving methodology was that they felt they had to wait ages for food to arrive. It’s a fair enough comment, but everything is cooked fresh and by hand, and with Jian Carlo at the helm that means if you have to wait then you just have to wait. Don’t like it? Live with it. But, oh, Lord, when the food arrives, it lands gracefully and with such amazing comfort-food flavours floating around and from it that you instantly forget about the hunger pangs. Simply put – this is the best Italian food you’ll eat in Ireland. Shared starters of garlic bread and mushrooms are virtually hoovered up; mains-wise, the pizzas are paper-thin, with just the right density of crunch and crust, while the pasta dishes swirl around in juices that are as lip-smacking delicious as they are probably sinful (which is why, along with ordering from the menu, we simultaneously ask for two takeaway pasta dishes for removal at the end of the evening – we’ll be having those the following night, thank you very much). The portion sizes, too, are beyond generous. If the food doesn’t get you (but it does, it genuinely does), then the pricing of the food will – in a way that this renowned fishing village will fully understand – hook you sharpish and reel you in. Pretty much all of the mains are in the region of €10, which is unheard of for a restaurant of such quality. The atmosphere, meanwhile, is brighter and much smarter (but no less Italian) than the Drogheda eatery of old, with familiar red gingham tablecloths, wall-hanging wine bottles and wicker placemats very much to the fore. To say we’ll be coming back here again and again is a lie, as we’ve never really been away. 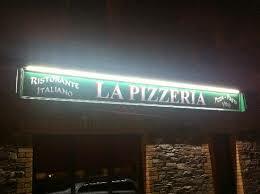 Oh, one more thing – what about the old La Pizzeria premises on Drogheda’s Peter Street, I hear you ask? Over four years on, it’s still laying bare and empty, a dusty remnant of shared lives. For once (but not really once – as we said, his bark is worse than his bite), Jian Carlo has reason to smile quite a lot these days. FACT BOX THE TAB: Dinner for four, with wine (two bottles of Nero D’Avola) and two takeaways (Spaghetti Carbonara and Fettuccine Alfredo) came to €124, €15 tip. HOW TO: Mon & Wed-Sat, 6pm-10pm; Sun, 5.30pm-9pm. Closed Tues.